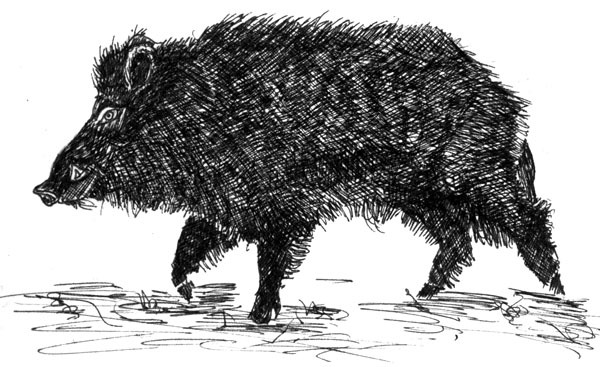 The launch of the War Pig is almost upon us, and in the effort of secrecy I have taken past pictures of the War Pig off my blog, after the 11th february they will be back up again. I have been working on a children's story of the War Pig which I finished yesterday and have sent off to Blurb to be printed, what a blooming adventure that was, firstly making up the story, maybe not that difficult as I made up stories for my children a lot of the time, but more surprisingly is that I have illustrated it, obviously I can't put all the pics up here, but as a taster I have posted the Polden Pig. When the book is published you will be able to read it and order copies. I will also make an ebook which will as a bonus have me reading the story as well. What joy.